Rain Halts Stake Classes—Celebration Finishes on Sunday! Bo’s April Charm, with Jerry Middleton up, wins the 1984 World Grand Championship. The five-year-old grey mare is owned by Judy Middleton of Springfield, Mo. Sired by Missouri Bo, out of a daughter of Merry Boy Sensation, Charm began her life as the odd colt nobody would buy from Jerry. Under his tutelage Bo’s April Charm has had a brilliant show career. The Celebration’s closing performance drew a capacity crowd. After a week of grueling competition and a pesky cough that had gradually spread through the horse barns, the moment of truth was near. Two men from Arkansas, a pair from Missouri, and one from Kentucky were about to pick the breed’s new Champions. Umbrellas and rain gear were visible around the ring as the traditional introduction of officers and board members on horseback took place under threatening skies. A handsome trio of mares, 1982 Grand Champion Travelin Suzi, 1983 Grand Champion Yankee Sweet Charity, and 1984 3 Year Old Futurity Champion Lad’s Perfect Blue Angel carried flags during the opening ceremony. When they fox trotted from the arena with the colors, the preliminaries were finished and things got down to the nitty gritty. Seven sleek class winners were led into the ring. 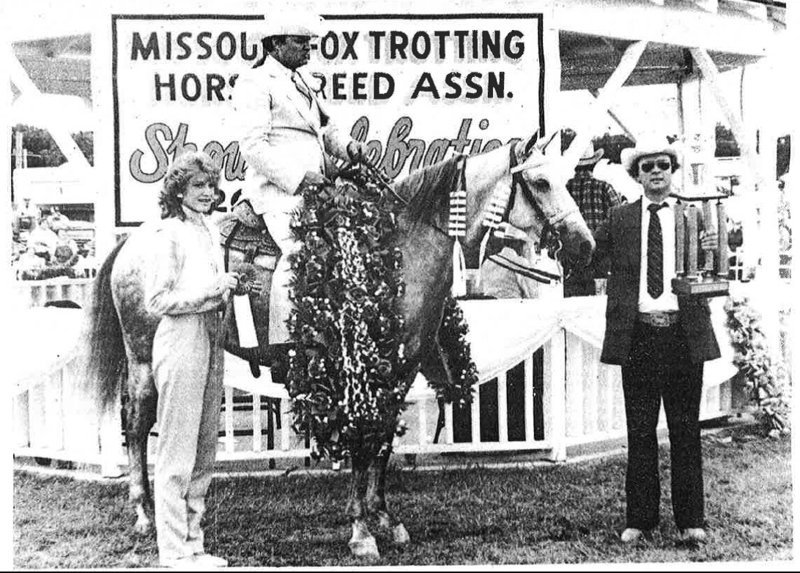 When the judges’ cards were scored, Prince Charger, a chestnut stallion owned and shown by Don Freeman of Marshfield, Mo., was the 1984 World Grand Champion Model Stake winner. Next came the ride for the roses in the popular new Amateur division. 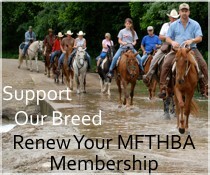 By definition an amateur is a person who has not accepted any kind of remuneration for riding, training or showing a horse in performance classes within twelve (12) months from January l of the current show season. Competition was stiff. Dr. Andrew Love of St. Louis, Mo, made a fine show on his black three year old, aptly named Yankee’s Housecall, and won the World Grand Champion Amateur title. Housecall fox trotted his victory lap to ringing applause. By the time the Two Year Old Stake Class hit the ring the lightning flashes were close, but everybody stayed in place for they were anticipating a shoot-out between a pair of palominos; one the top placing mare, the other the top placing stud. Halfway through the class a few warning raindrops fell and the cautious spectators bolted for cover. The faithful adjusted their rain gear and watched intently as competition really heated up the second way of the ring. Then it fell a flood. The crowd scattered but the class continued. People took refuge in barns and vehicles. The cook shack had standing room only. Everybody swapped rain stories, ate, and waited for the rain to stop but it didn’t. Word circulated that Rex’s Golden Touch, ridden by Steve Dampier and owned by Jim Arthur of Rogersville, Mo. was the new World Grand Champion Two Year Old but few had actually witnessed the end of the class. Nobody was really surprised when the show was called but it was a disappointing anticlimax. It was the first Stake Night rainout in 26 years. Families regrouped and headed through the rain for their rigs. Sunday turned out sunny and humid. Despite Saturday night’s heavy rain, the ground crew worked the arena into amazingly good shape. The ranks of spectators and horses had thinned considerably but the top contenders were on hand. Angela Sapp, a young lady from Columbia, Mo whose super b riding attracted favorable crowd comment all week, received the Grand Champion Youth Equitation Award. Other youth receiving Reserve Champion Awards for their outstanding equitation were Vance Vahle of Bolivar, Mo., David Love of Manchester, Mo., Kelly Hurst, of Rogersville, Mo., and Shelly Frisella of. St. Louis, Mo. The Humanitarian Award was given to Ralph Hawkins of West Plains, Mo. Tall, soft spoken Ralph served unselfishly for many years as an inspector and Board Member prior to his retirement last year. Widely known for his fairness and good judgment, Ralph continues to be a valuable asset to the Association. Around 1 p.m. the loud speaker informed contestants that classes would work the minimum time established by the rules. With no preliminary ceremony and no organ music the three year olds entered the ring and the quest for a national title was on. The class was a pleaser. 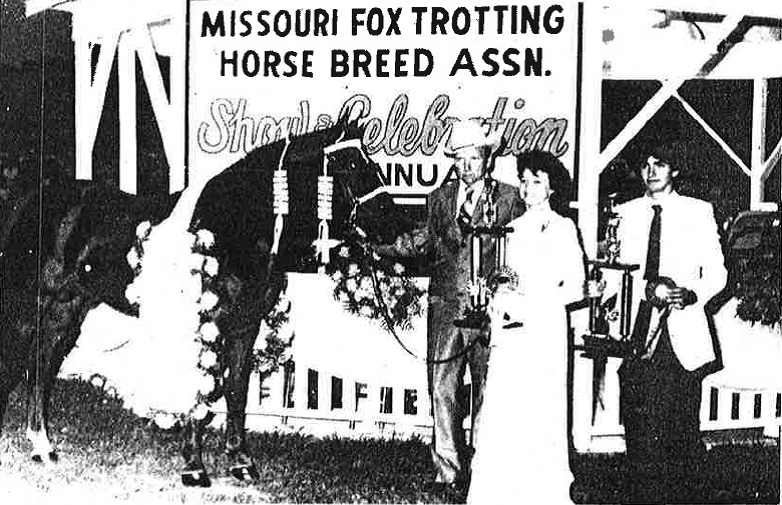 Missouri Missy C. ridden by Curtice Williams and owned by Don and Carol Cunningham of Ava Mo., topped the field. The new World Grand Champion Three Year Old fox trotted her victory lap wearing her second .garland of the show. On Friday night she’d captured the Ladies Championship Stake with Jill Jones of Waynesville, Mo. up. The Four year Old Stake Glass turned into a duel between the top qualifying stallion and the top qualifying mare. 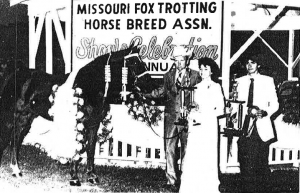 With a nearly flawless performance, the stylish chestnut mare with the unlikely name of Missouri’s Expensive Hobby became the World Grand Champion Four Year Old. The Texas section of the crowd cheered wildly. She was ridden by Justin Dampier and owned by Jimmy Morris of Texas. Every eye and every video camera was fixed on the gate when the horses entered the ring for the Grand Champion Stake. There was plenty to watch and the crowd screamed for its favorite as the class drew to a close. 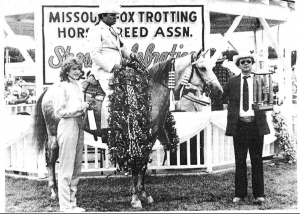 When the new World Grand Champion was announced it was Bo’s April Charm, ridden by Jerry Middleton and owned by Judy Middleton of Springfield, Mo. Charm finished her show career with her remarkable record of never being defeated in Celebration competition intact. She is the first horse to win the Two, Three, Four, and Grand Champion titles in consecutive years, plus a Ladies Stake when she was three.